The Jackson and Macon LACs WILL BE OPEN on Advising Day: Tuesday, April 9. Both LACs will CLOSE at 6 p.m., Tuesday, April 16, for Easter. We will REOPEN at 8 a.m., on Monday, April 22. The Jackson and Macon LACs offer free, drop-in assistance provided by Learning Consultants who possess a variety of specialties. Either advanced or intermediate writing help is available at all times during operating hours, and a Mathematics and/or Sciences Consultant is on duty during most of those hours. Learning Consultants also help to strengthen basic skills, such as test preparation, computer/Internet use, reading, and research. We also offer free one-on-one or small-group tutoring for curriculum classes via our CRLA-certified Tutor Program. This program offers valuable academic assistance through competent, qualified peer and non-peer tutors who strive to encourage student motivation and achievement as well as promote academic excellence. In addition to the earlier mentioned services, we offer free online tutoring. 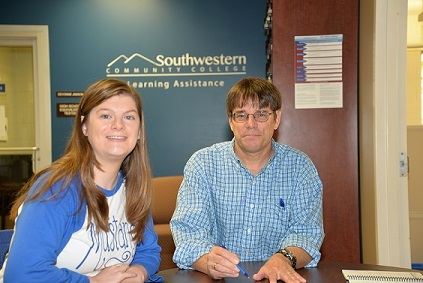 Each SCC student is given 240 minutes per semester of online assistance in content areas, including essay submissions. Please click on the links to the left to get more in-depth information about the LACs, Tutor Program and Online Tutoring. The fall and spring semester operating hours for the Jackson and Macon LACs are 8 a.m. - 6 p.m., Monday - Thursday, and 8 a.m. - Noon, Friday, Summer operating hours for both LACs are 9 a.m. - 3 p.m., Monday - Thursday, and 8 a.m. - Noon, Friday.